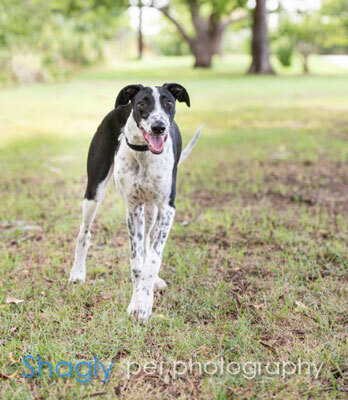 Patrick is a six month old white and black male born March 3, 2018. 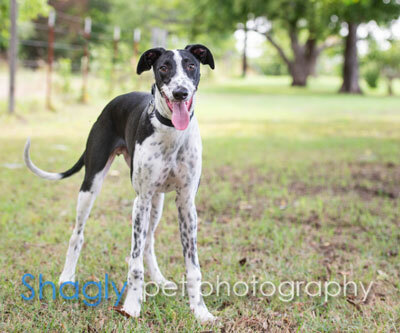 He is the result of an "oops" litter born in southwestern Oklahoma, where the mom is a greyhound and dad is a staghound. This boy already is taking after his dad in size. Patrick is cat tolerant at this time. Hi I'm Patrick and I'm a puppy! Yes, I am extremely adorable and still need lots of patience, time and training. I am getting better at taking longer naps though when I'm awake, I will keep you on your toes! I do well in a crate but 8 hours would still be too long for me at this time. I’m what they call a problem solver, I’ve have mastered the skill of knocking down baby gates and moving things out of my way to get closer to people. My foster Mommy is creative and so I am! Once in a while I have a memory lapse and will forget to let you know that I need to go outside - when you gotta go....you just go! I sure would like to be better and hope my forever family will help me learn. Now that I’m taller, I really enjoy counter surfing - so be sure to keep stuff out of my reach! Basically if I can reach it, its fair game. Food is my favorite and sometimes I love it so much I will enjoy it a second time around (sorry), so supervised potty time is a plus. I love my greyhound foster sisters and I would be lonely without another dog to play with. We love to play tug o' war and chase each other around the yard. We also enjoy a daily walk together and except for trying to find things to put in my mouth, I do pretty well on a leash. I do like to try to chase bicycles going by so please keep a lookout so I don't jump out at one and get hurt. Big trucks are fun to try to chase too! The couch is my favorite place to relax, especially when there is room for me to sneak in next to foster mom and get some much wanted cuddling in. I currently live with 2 cats and find them curious and amusing. At times I think its fun to chase them but am promptly reminded that they don't feel the same! I may bark at them and will regretfully retreat. I love playing fetch and will return the ball to you, a remarkable trick for a greyhound! My foster mom finds it helpful when she wants to watch TV, I get to play ball in the house and she can sit for a bit. One of my most enduring traits, per foster mom, is when I nurse a big stuffed bunny to help comfort me and put myself to sleep. She hopes I never stop doing that! Yes I am the adorable Patrick and now you know what I'm all about...the good, the bad and the puppy! Patrick is just a big puppy full of love and energy. Patrick will be 8 months old November 3rd and is 60 lbs and growing. Because of his puppiness and size, he will need a a family that can physically handle 60+ lbs of jumping, pulling and love (play) bites. A walk or two a day definitely helps but a fenced yard is a must so he can run laps to let loose and run off excess energy. He would do best with another dog to play with but it needs to be compatible with his size and style of rough play. No doggy doors for Patrick at this time. He is still in the eating everything phase, including poop and needs supervised outdoor time. He also needs a home that is “puppy proof”. All reachable décor needs to be removed and counters need to be cleared of items. Patrick is a counter surfer and can take dishes out of the sink. He still finds standing on end tables fun at times too! On a pawsitive note, Patrick is doing well with his house training as long as he is kept on his schedule. He gives very vague signals when he needs to go outside so you need to keep watch to get him out in time. Patrick also sleeps all through the night in a crate. He will need to be crated when left alone, he is a master at breaking down pet gates and barriers so a crate is required. Although he has lived with cats for the last 5 month's, he still enjoys chasing them a little too much and his feline friends are not comfortable hanging in the same room with him. This sweet boy is currently attending obedience training and will not be available for a couple more weeks. Hopefully it will be worth the wait and he will master basic commands and have better manners. Patrick is a puppy and as all puppies, he needs lots of love, patience and time to grow into the wonderful dog he will soon become. Patrick will provide lots of love and affection in return and he deserves to find just the right home where he will thrive forever!